This is a list of properties and historic districts in Montana that are listed on the National Register of Historic Places. The state's more than 1,100 listings are distributed across all of its 56 counties. ( #94000862) 237 Pennsylvania St.
( #80002399) 239-225 Indiana St.
( #94000867) 201 Pennsylvania St.
( #15000815) 103 & 105 N. Main St.
( #95000535) 213 Main St.
( #05000279) Approximately 3.5 miles northwest of Scobey on Tande Ranch Rd. ( #04001435) 4 S. Main St.
( #14000079) Mi. 2.2 Ismay Rd. ( #98000946) 723 S. Main St.
( #05001377) 1 Main St.
( #07001293) 101 Main St.
( #00001567) 23 Main St.
( #86001934) 447 4th Ave.
( #85003385) 532 2nd Ave.
( #89001630) Roughly bounded by 3rd St., 7th Ave., 11th St., 5th Ave., 10th St., 3rd Ave., 7th St., and 1st Ave.
( #94000865) 140 1st St.
( #10000133) 17863 Beaver Creek Rd. ( #86000682) 306 3rd Ave.
( #80002421) 419 4th Ave.
( #100001898) 1000 ft. S of S end of Crystal Dr.
( #80002422) 200 Centennial Ave.
( #11000951) Legion Ave. & Main St.
( #07000816) 7th and D Sts. ( #12000829) 133 C St.
Lakeside Lodge of writer and politician Frank Bird Linderman. ( #08001325) 503 4th Ave. SW.
( #80002423) 501 Main St.
47°41′28″N 114°09′44″W﻿ / ﻿47.691111°N 114.162222°W﻿ / 47.691111; -114.162222﻿ (Polson Feed Mill) Polson Demolished. ( #97000975) Junction of Washington Ave. and 1st St., E.
( #12000593) 302 California Ave.
( #95001062) 223 Dewey Ave.
( #06001178) Crossing the Kootenai River at Riverside Dr.
( #06001179) 316 E. Yaak Ave.
( #80004592) 101 Main St.
( #77000820) 310 2nd Ave., NE. ( #13000224) 9 Main St.
( #98001084) Crawford St. at Central Ave., S.
( #94000140) 206 E. Main St.
( #07001243) 600 1st St., W.
( #88001120) 524 1st St., W.
( #09000815) 301 E. Main St.
( #95000383) Junction of Moulton Ave. and Rowley St.
( #80002428) S. 1st St.
( #97001452) 201 Taylor St.
( #80002429) 15 4th Ave., SW.
( #85000646) 820 3rd St.
( #10000184) 8 Trails End Rd. ( #82003179) 203 2nd Ave., SW.
( #02000049) Fiddler Creek Rd. ( #11000588) 523 & 528 E. Pike Ave.
( #84002506) N. Woodward St.
( #86003676) 4 W. 1st Ave., N.
( #87001200) U.S. Route 10 and Rapelje Rd. ( #100000916) 303 W. Rosebud Rd. ( #86002949) 142 S. Woodard Ave.
( #91000422) 405 SW. 1st St.
( #01000921) W. Rosebud Rd. ( #10000497) Southeast corner of Clark St. and Second Ave.
( #98000125) 225 McLeod St.
( #02000725) 314 McLeod St.
( #85002424) 139 McLeod St.
( #95000900) W. 4th Ave.
( #06001093) 1 Main Ave., S.
( #93001375) 0.25 miles (0.40 km) south of Gus Blaze Rd. ( #80002433) Central Ave. and 1st St.
( #12000173) Mile 6, Marias Valley Rd. ( #94000866) 400 Main St.
( #06000040) 100 Montana Ave.
( #93001447) 520 Division St.
( #80002434) 106 S. Central Ave.
( #88001024) Southern end of Central Ave.
(#80002435) June 3, 1986 121 N. Central Ave.
( #90000356) W. Orgain Ave.
^ Going-to-the-Sun Road and Great Northern Railway Buildings are listed in both Flathead and Glacier counties, the Lewis and Clark Bridge spans the Missouri River between McCone and Roosevelt counties, the Butte, Anaconda and Pacific Railway Historic District and the Butte-Anaconda Historic District are split between Deer Lodge and Silver Bow counties, Fort Union Trading Post National Historic Site is listed in both Richland and Roosevelt counties (as well as McKenzie and Williams counties, North Dakota), Froggie's Stopping Place on the Whoop-Up Trail is listed in both Chouteau and Pondera counties, the Fred Robinson Bridge spans the Missouri River between Fergus and Phillips counties, the Judith Landing Historic District is listed in both Chouteau and Fergus counties, and the Red Lodge-Cooke City Approach Road Historic District is listed in both Carbon and Park counties. ^ a b c d e f g h i j k l m n o p q r s t u v w x y z aa ab ac ad ae af Numbers represent an ordering by significant words. Various colorings, defined here, differentiate National Historic Landmarks and historic districts from other NRHP buildings, structures, sites or objects. ^ a b c d e f g h i j k l m n o p q r s t u v w x y z aa ab ac ad ae The eight-digit number below each date is the number assigned to each location in the National Register Information System database, which can be viewed by clicking the number. ^ Bradshaw, Glenda Clay. Montana's Historical Highway Markers. 4th ed. Helena: Montana Historical Society Press, 2008, 83. 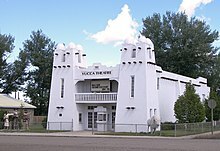 Wikimedia Commons has media related to National Register of Historic Places in Montana. Montana History Wiki section on National Register of Historic Places sign texts.